Feel the electricity coursing through your veins in Electric Sam, an ecstatic magic cow themed new online slots 5-reel destined to get you winning big and achieving mystical free spin bonuses. Encounter all your standard fruit machine treats in this high-octane online slot that will have you enjoying endless fun for hours. ELK gaming creates their online slot games from their home base in Sweden, priding themselves on the artistry and exceptional mathematics that make their games so playable. There are thousands of fans making hundreds of transactions on ELK slots at any given moment. Taking a peek at the timeline of content delivered to market on their website, shows a progressive company in a constant state of evolution. Learn more about casino by mobile and start spinning. Deep in the dense foliage of a mystical forest, an enticing neon glow awaits the most intrepid, adventurous gamers. 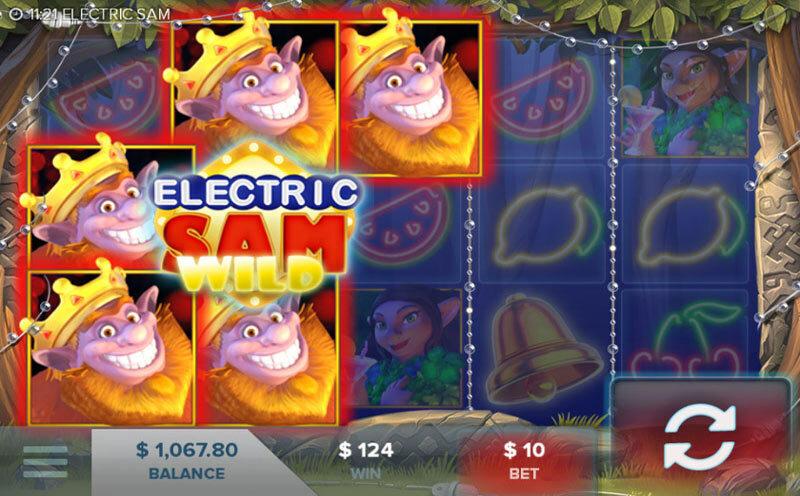 Electric Sam is a 5 reel, 243 pay line online slot designed by ELK Gaming. Complete with a whole host of electric treats, brought to you by a host of charming mystical sprites, Electric Sam can be played from £0.20 to £100.00 per spin. Intriguingly, Electric Sam is actually the name of the Casino, where the game is set – and it’s rare that we come across one of our favourite gaming dens this far into a forest! The concierge is a sprite with a giant, beaming smile and a vibrant ginger beard, Sam, who is joined by the local hula-girl, Sandra, and administrator, Maggie. 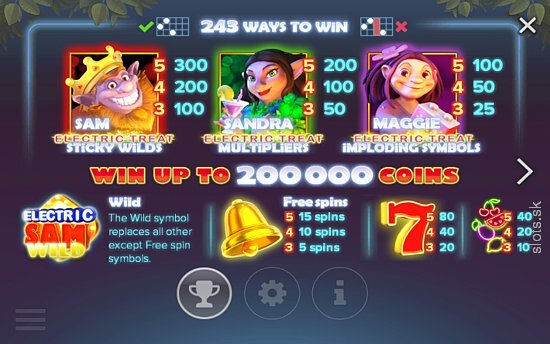 The three characters are joined on the reels by neon Fruit symbols, a Lucky 7, the Free Spins symbol – a Golden Bell – and the Electric Sam Wild, which can substitute for every other symbol on the reels apart from the Scatter. Sam himself is the most valuable symbol on his own – 5 of him will reward us with 300 coins – while he, Sandra and Maggie all offer their own individuals bonuses at different stages of the game. There are more general Easy promotion slots here. The Free Spins are triggered by landing 3 or more Golden Bells, and during the feature the symbols we land depend on what kind of bonus we receive. Landing 3 Maggie symbols will cause winning symbols to implode, and be replaced by others – with another chance of a win. 3 Sandra symbols will trigger an increase in our multiplier, each time, and landing 3 Sams will trigger a Sticky Wild feature – as Sam himself will turn electric and manipulate the symbols at his will! spin the wheel today! When combined with a range of Betting Strategies, each one based on how our spins and wins have been faring, the game has a massive amount of variability. With this additional level of tactical betting available for us to deploy as and when we choose, the casino set in the forest can suddenly feel like the real thing! ELK has created an unusual theme here, with Electric Sam. 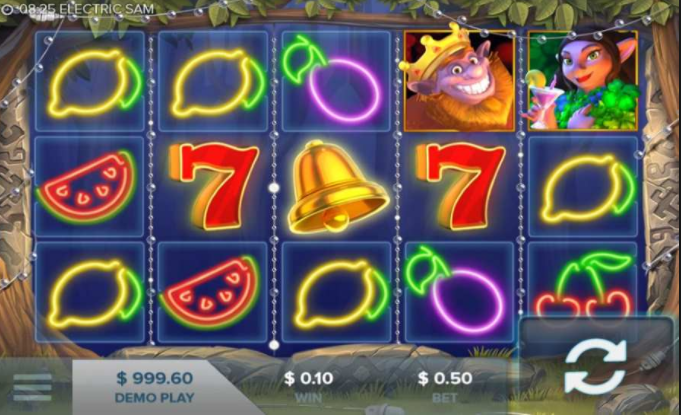 The idea of a forest casino within an online casino really works, and the bright neon symbols and cool graphics really hammer home the environment. The Betting Strategies and variety of ways to win within the Free Spins feature also make for some big wins, and great fun. 9/10 from Dream Jackpot, for creating a great gaming environment within our favourite gaming environment! 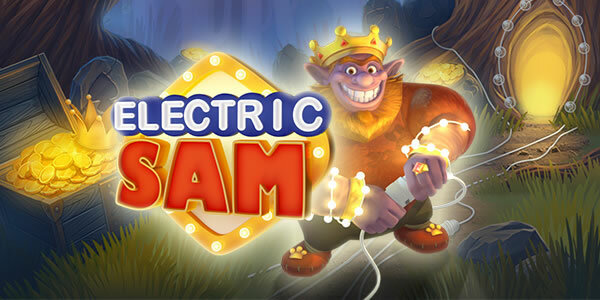 If you enjoyed Electric Sam then you might also like to try another online slots, join today!